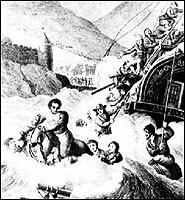 In 1773, there was a particularly bad storm in Table Bay. There were five ships of the Dutch East India Company lying in the bay. None of the vessels should have been in the bay. Instead they should have sought anchorage at Simon's Bay as this was considered to be a safer winter anchorage. It was the Company's ruling not to anchor in Table Bay after May 15 due to the unpredictable weather. For several days the ships had been ready to put to sea, but a north-westerly gale had been blowing hard and had prevented them from sailing. On May 31st 1773, the gale had reached its full height and each of the ships had dropped additional anchors in an effort to hold them steady. Soon the hawsers holding the anchors began to snap undert the pressure of the storm. Worst placed of all the merchantmen was De Jonge Thomas, carrying 207 men and captained by Barend Lameren. At five o'clock in the morning of 1st June 1773, she was straining at her last anchor. Rather than be caught unprepared and be driven ashore at the mercy of the storm, Lameren decided to beach the vessel whilst he could still choose the spot. Accordingly, the anchor rope was cut, and with the light sails set, the ship bore down on the beach. The captain had chosen the level stretch north of Salt River mouth to run ashore; unfortunately he was unaware that that the Salt River had burst its banks and was emptying into the sea near the spot he had chosen. Even more unfortunately, at the moment of impact, De Jonge Thomas swung broadside to the beach. Less than two minutes pounding from the gigantic waves broke the ship's back and she parted in two at the mainmast, which crashed overboard. This was the sight that met the eyes of Governor Van Plettenberg at dawn, when he scanned the bay anxiously. His first reaction, no doubt, was to breathe a prayer of thanks that the eighteen money chests which De Jonge Thomas was carrying from Holland were still ashore in the Castle for safe custody. Then he sent thirty soldiers down to the beach. Normally this procedure was of little avail to the unfortunates wrecked out in the bay, but that day it was to save lives. The first military step, as usual, was the erection of a gibbet on the beach, to hang any trespassers. Then the soldiers commenced collecting salvaged goods, periodically casting a sorrowful glance out to sea, where pitiful cries could be heard from those survivors still clinging to the wreck. Amongst the soldiers was Corporal Christiaan Woltemade; in the course of the day his father, Wolraad Woltemade, rode up on horseback, bringing him a bottle of wine and a loaf of bread. Wolraad Woltemade was no youngster. As a soldier, he had been stationed at Muizenberg as early as 1752, and by 1770, he was in command of that post. He must have retired after that, though there is some confusion as to his occupation in 1773. Thunberg says that he was the keeper of the menagerie (at the top of the Company's Garden), whilst the Dagregister refers to him as a dairyman. Filled with pity for the luckless sailors aboard the wreck, Woltemade mounted his horse, Fleur, and urged the animal into the sea, determined to save some of those in peril. Why he did not carry a line to the wreck is not clear, but the fact is that he rode into the sea without a rope. The horse was a fine swimmer and fought its way gamely through the surf. As they approached the wreck, Woltemade turned the horse and called for two men from the ship to jump into the sea and grasp the horse's tail. After a moment's hesitation, two men threw themselves into the water and did so, whereupon Woltemade urged the horse forward and dragged them to shore. Not satisfied with this feat, Woltemade returned immediately and rescued another two men. He repeated this again and again, until he had drawn fourteen men to safety. By this time, instead of hesitation there was competition amongst the sailors for the next place, as for the horse, it was staggering with exhaustion. Woltemade dismounted to rest the poor animal, whereupon a great cry of despair went up from the wreck. Despite the entreaties of his son, Woltemade mounted the horse again and rode back into the water. Realising this was probably the last trip, the men onboard lost all restraint. As the labouring animal neared the ship, half a dozen men jumped into the water and grasped the horse; one stupid fool caught it by the bridle, dragging the horse's head under. It was all over in a moment - horse, rider and sailors disappeared beneath the waves. No further attempt was made to rescue those aboard the wreck. As night fell, they watched the beach empty as the soldiers returned to their barracks, and the officials to their warm firesides. Through the night they clung to the wreck in sodden misery; gradually the weather cleared. On the morning of June 2, the sea was still rough, but Jan Jacobs, the junior mate and twenty-four men waded ashore from the wreck. In all, forty-seven men had survived, of whom fourteen owed their lives to Woltemade. That day the shore was littered with bodies; amongst them were the Captain, and Wolraad Woltemade. The Captain was given an official funeral, but there was nothing so grand for Woltemade. The general opinion at the Castle seems to have been that he was an officious fool who had lost his life unnecessarily. In the first report to Holland, his name is not even mentioned - though considerable space is devoted to the eighteen boxes of money providentially saved. However, Karl Thunberg, who had witnessed the event, did not forget Woltemade; nor did the formers countryman, Anders Sparrman, when he wrote his famous book "A Voyage to the Cape of Good Hope" in 1775. And so the story of the incredible rescue spread. The company named one of its ships the Held Woltemade, and Woltemade had become a legend. Ironically, the ship Held Woltemade, surrendered ignominiously to the English in 1781, without firing a shot, and passed into history. Few people indeed, will be able to tell you the name of the Jonge Thomas, compared with those who know Woltemade's name - yet ironically, none know the name of the real hero, the horse. Woltemade's widow and sons living in Batavia were compensated. A statue of him was created in later years by the sculptor J. Mitford Barberton and erected in the grounds of the Old Mutual Assurance Society in Pinelands, which grew on the grazing fields of the dairy Woltemade had ostensibly managed. A railway station was named after him on the old dairy-farm grounds and this serves the mourners coming to visit the Woltemade Cemetery. The highest South African decoration for bravery was also named after him, the Woltemade medal.